Hollywood Forever is quintessential Southern California. Open: Every day 7 a.m. to 6 p.m.
2009 was Hollywood Memorial Park’s 110th year, which makes it the oldest surviving graveyard in Los Angeles. Once the height of fashionable final addresses in the Los Angeles area, Hollywood Memorial Park, also called the Cemetery of the Immortals, served as the final resting place for Peter Lorre, Cecil B. DeMille, Tyrone Power, Mel Blanc (whose headstone reads, “That’s all Folks!”), director John Huston, and many others from the fledgling film industry. In the late 20th century, the cemetery fell on hard times, especially after the 1994 Northridge earthquake destroyed monuments and damaged the mausoleum, throwing over the marble statues of the apostles and shattering the stained glass skylights. In stepped Tyler Cassity, who had grand plans for making cinematic history turn a profit. He started by legally shedding the dignified (if funereal) Memorial Park and changing the cemetery’s name to Hollywood Forever. One of the most inspiring restorations is the spiffed-up Douglas Fairbanks monument. In true Hollywood style, Fairbanks’s widow paid $75,000 in 1939 ($1.2 million in today’s dollars) for a marble sarcophagus raised in front of a classical Greek wall adorned with a bronze silhouette of the actor. Running up to the shrine is a 100-foot reflecting pool. In the past, the pool had been full of litter rotting beneath a scum of algae. Now bright water lilies bloom there. More impressive is the pink granite column standing on the edge of the central lake. At her death in 1952, Hattie McDaniel’s last wish had been to be buried at Hollywood Memorial. After all, she had been the first Black woman to sing on the radio and her career spanned over 300 movies. Most remembered for playing Scarlett’s Mammy in Gone with the Wind, McDaniel had been the first African-American recipient of an Academy Award. She belonged among the cinematic pioneers — but was rejected because of the color of her skin. In October 1999, nearly 50 years after her death, that indignity was commemorated — if not made right — by the placement of a cenotaph to her memory. McDaniel’s grave remains undisturbed in Rosedale Cemetery (where she broke the color barrier), but now she has a monument among the immortals, as she wished. Another legend has long rested in Hollywood Forever. Rudolph Valentino lies in a vault toward the back of the mausoleum. When he died suddenly of a perforated ulcer and ruptured appendix in 1926, mourners thronged the graveyard. For years, women in black left roses at his marker. Hollywood Forever has assembled a video scrapbook to Valentino’s memory. Consisting of publicity stills, newspaper clippings, QuickTime film clips — all accompanied by a musical soundtrack — the short video tribute gives a greater appreciation for the beauty and talent of the legendary screen lover. Newspaper stories, clear enough to be legible, float above a background of mourning badges and film reels. My only criticism? It would have been nice to have the film clips captioned, so viewers could track down the complete movies themselves. One of the most popular ways the cemetery continues to draw people in is by showing movies on its mausoleum wall on summer evenings, keeping the memories of its permanent residents alive. Also well-attended is its Dia de los Muertos celebration. The community comes together to build huge altars. Attendees are encouraged to dress up as skeletons. South and Central American dancers and musicians perform. This year’s event is scheduled for October 22. Show biz icons of the current day also call Hollywood Forever their final home. Rozz Williams, singer for Christian Death, has a niche covered in lipstick kisses in the new columbarium. Both Johnny and Dee Dee Ramone have monuments near the lake. Hollywood Forever once again conveys immortality. The famous are dying to get in. Join their event mailing list. 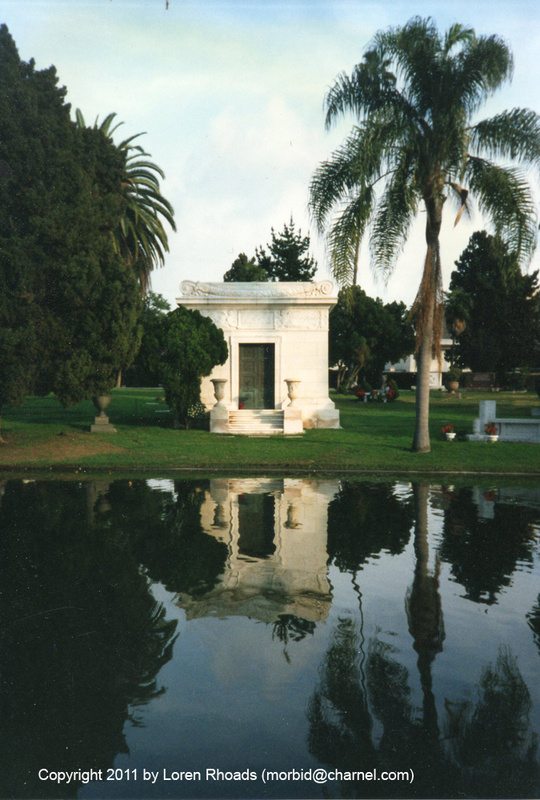 This entry was posted in Cemetery of the Week, Famous person's grave and tagged California cemeteries, Hollywood Forever, Los Angeles cemetery, private mausoleums. Bookmark the permalink.